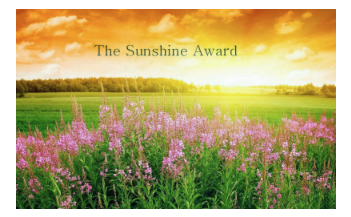 Rosie's Treehouse: The Sunshine Award. Erm, I guess, fish and chips? Um, I have heaps, too many to count. That's pretty hard. I don't really have a favourite. 1. If you were an animal, what would you be? 2. Can you drive a car? 3. What is your favourite thing to cook? 5. What would be your dream holiday? 6. What is your favourite pastime? 7. White, Milk, or Dark Chocolate? 8. Have you received this Award before? Thanks Rosie.... So I suppose I am meant to do it even if I have already been nominated for it a few months ago too? I want. Just don't expect my answers to be very to the point... or very short either. Great post Rosie I like reading peoples answers. 2. Yes, but not on my own yet. 3. Lemon meringue pie, I think. 4. Both, but with pools you don't get unknown sea creatures. 5. To travel the whole world with my family. 6. Playing music with sibs, cooking, and writing random stuff.